Side Note: (side note to side note, isn’t it odd I am starting with a side note?). Back to side note. Somehow, as I planned this week, I happened to put down all posts related to food and children. Even the giveaway. I didn’t plan it that way but if I had thought it out, I would have. Sorry if you are randomly reading this post three years from now–if you want to see what I am talking about, just scroll through what was yesterday and what will be in the next few days. Okay, back to post). Finger foods! What a conundrum finger foods can be (conundrum=problem–had to clarify because I had to in Sunday School yesterday). I get a lot of questions surrounding finger foods. I totally get it. You have a child you have been feeding nothing but milk for about 6 months or more and suddenly you are supposed to feed finger foods…but what is safe! At what age can I feed it! How small do I need to chop it! Do I cook it! What if my baby gags! Just a few questions that pop up. 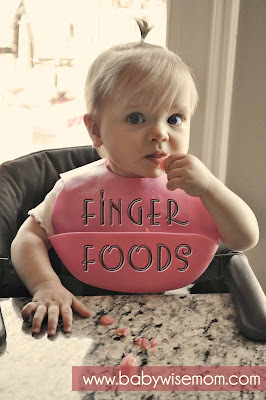 WHAT AGE CAN YOU START FINGER FOODS? You can start when your baby is ready. Don’t you just hate answers like that?!?!? That answer exists because there is no magical age when all babies are ready. Babies are individuals. Generally speaking, some babies are ready as young as six months old. I have really done finger foods around the 7 month mark with all four of my children. See, mom needs to be ready, too. Keep this in mind. There are thousands of mothers out there feeding their babies solids through Baby Led Weaning–which involves feeding a baby chunks of real food, not purees. These babies are not choking to death, so your baby can handle finger foods. WHAT ARE SIGNS YOUR BABY IS READY? Chew: You will want baby capable of making a “chewing” motion with her mouth when she has food in it. Desire: You will need baby to want to eat the food–you can’t force feed food–especially finger foods. Fine-Motor Development: Your baby will need to be able to pick up foods in order to eat finger foods. Your baby does not need molars or any other type of tooth. Your baby will not get molars until closer to a year (Brinley is 13 months and has no molars yet). Keep in mind that your baby will need to practice to get good at eating these foods. So don’t be alarmed if baby is not good at first. It will take time! She will get better as she practices it. Choose a food you feel comfortable with (see lists below). Cut it into the size/shape you feel comfortable with. Put a few pieces in front of baby. Next, I busy myself with something else to do–I stay close by, but I don’t stare down the child. I tend to get involved more than I should, so if I see the poor dear struggling, I will pick the food up for her and put it in her mouth. I think it is best for the child to learn to do it, and the best way to learn is practice. If you can sit and watch the struggle without saving your child, do it! But if you are like me, wash some dishes or look through a recipe book or something. The first few times, there is a good chance your baby will gag. Don’t freak out. This is not for the feint of heart. Be there in case gagging leads to real choking (which in my four children it never has), but let the child work it up. This is unfortunately a real life experience in learning how to chew and swallow food. Size depends on you. You either want to go small or big–not in between. It can be big enough the baby needs to take bites of it (so cut into long strips or wedges) or more into bite-sized pieces already. Bite-sized pieces require a pincer grasp to pull off. I am a bit more cautious, so my pieces start out bite-sized, which is why my kids are a bit older than many with starting finger foods. You can also start with whole foods–like a whole bagel. Your baby won’t put that whole thing in her mouth, but she will be able to hold the thing to her mouth. The younger the baby when starting, the larger the size will need to be. The size you don’t want is the in between where the child shoves it all in the mouth and has too much to chew. The size about the size of a Cheerio is good. The shape to avoid is the perfectly round circle–the one shaped like the esophagus? You know. You don’t want the baby putting the round beauty in her mouth, swallowing it whole, and lodging it in her throat. Be sure the foods you start out with aren’t too slippery. If you chop a banana up into squares, it will be too slippery for a baby to pick up. To do bananas, I cut about a 1-2 inch piece and then run my finger down the middle of it. It will break into 3 pieces. I then feed those pieces to the baby. You can help the texture by rolling the food in something safe for baby that is dry–like oatmeal (this tip is found in Super Baby Food by Ruth Yaron). As your baby gets older, she will be able to pick up even slippery foods. WHAT DO I FEED BABY? In reality, if it is cooked correctly for a baby (in other words, soft enough), and cut into a good size for baby, you can feed baby just about anything you would normally eat. Nuts are a no as whole foods. Honey is a no….but baby couldn’t pick that up anyway. You want to watch for allergies, so feed baby foods she has had in pureed form OR wait a few days between each new type of food so you can watch for allergic reactions. Gerber rice puffs–I start with these because, like I said, I am a bit cautious. I like that these dissolve easily. Fruits: Banana, melons, cucumber, peaches, pears, mango (just remember, if it is slippery, it can be difficult and therefore frustrating for your child). Make old foods taste better–add some cream cheese to that bagel. Spread a thin layer of peanut butter on that bread. Whatever you are eating–whatever you are having for dinner, figure out how you can get it into baby-safe size for her to eat, too. Having tacos? Give her some taco meat, some tomatoes, some olives (chopped), some cheese, and some tortilla pieces. The taco would be messy, but she can feed herself the parts. Do the same for soup–separate it out of the broth and into food pieces baby can eat. The sooner you get baby eating what your family regularly eats the better chance you have for having a toddler and older who just eats dinner rather than complaining about dinner. Make life easier! Use things to cut that will make it easier on yourself. Use a pastry cutter, a pizza cutter, or kitchen scissors to quickly and easily chop things up. We use pizza cutters to cut up pancakes. Sometimes your fingers are the fastest and easiest–for example I don’t cut olives with a knife, I just kind of smash them into several pieces. I squish it until it breaks and I rip it into four pieces. Much faster than cutting! I love, love LOVE Super Baby Food by Ruth Yaron. Another resource you might like (that I haven’t read) is Baby Led Weaning by Gill Rapley and Tracey Murkett. What are your finger food tips? Any favorite finger foods? With my 6 month old I've been doing a combo of purees and Baby Led Weaning. Mostly because I had already started oatmeal before I found out of BLW, but she does great with both!I still do the oatmeal mixed with peaches because she LOVES that! So I teach table manners (no helping, keeping hands on tray) with the oatmeal, and then I put all the food we're eating on her tray and let her go at it. She loves it and never tries to put it anywhere besides her mouth.I do still test for some allergies but according to our Pediatrician, unless the allergy runs in the family, there is a super slim chance of it suddenly occurring in my LO. But at 6.3 months, she's eaten everything we have (minus anything with sugar)–roasted veggies with spices, meatloaf, beans, all kinds of fruit, etc.It's so fun!